What is Historical Volatility and Why Do We Need Implied Volatilities? – Computer Aided Finance - Excel, Matlab, Theta Suite etc. What is Historical Volatility and Why Do We Need Implied Volatilities? Looking at financial instruments, one often finds the term implied volatility. 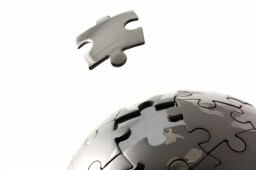 In this post, we want to describe what it is and what you can do with it. We start refreshing the term historical volatility and then we explain the implied volatility. An example of German DAX with real data concludes this post. where we have divided the sum of squared deviations by to account for the loss of degree of freedom from using the sample mean in the calculation. For sampled at daily and monthly time intervals, the annualized historical volatility is respectively and . Historical volatility can be useful in cases like benchmarking historical performances, assessing the behavior of economic variables, calculating historical risk measures, and so on. Since historical volatility is the number we get from looking into the past realized data, it may not be as useful when we try to predict the future behavior of asset returns. This is when and why we have the implied volatility, i.e. the volatility number implied from market prices. Denote , , a set of market prices of traded options on asset , the implied volatility is obtained by setting the market price to the theoretical price, , with the argument as the option strike price, the current asset price, is the option time-to-maturiy, the risk-free interest rate, and so on. Since the only unknown in is the volatility number , we can solve the inverse pricing function to obtain the implied volatility using the bisection or Newton‘s iterative method. The obtained implied volatilities contain information of the market’s assessment of future price movements, and thus is a forward-looking risk measure. Here, you can find a little solver for implied volatilities in VBA. 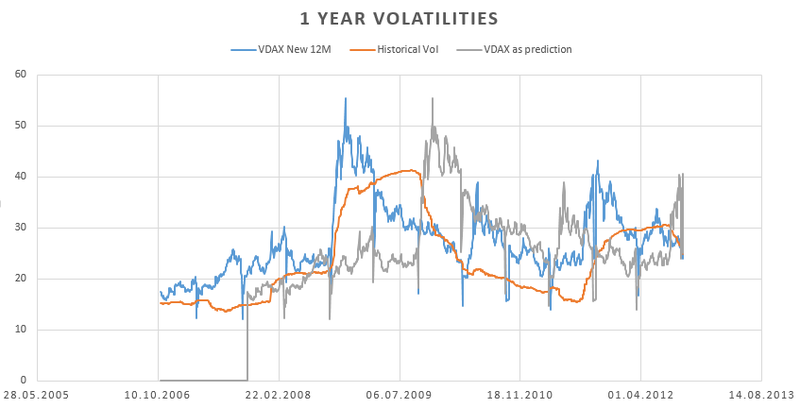 The following graphs show the series of VDAX-NEW implied volatility index compared to the DAX historical volatilities. 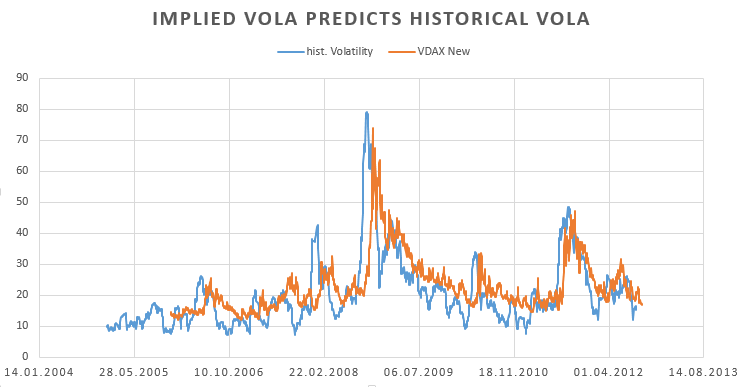 The implied volatility index is a good predictor of the historical volatilities. 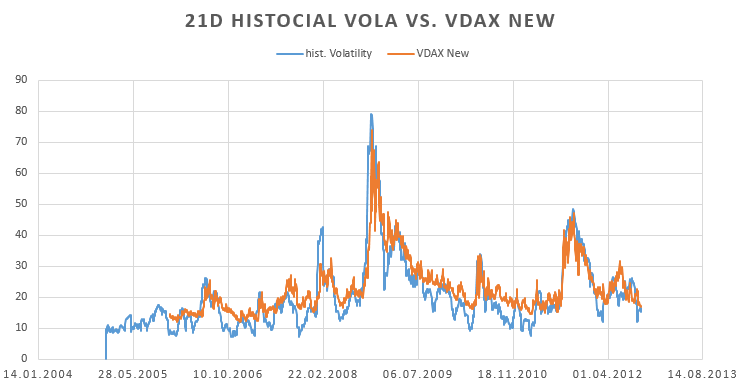 We can see that the implied volatility given by VDAX New and the 21-day historical volatility had similar values during the time presented. Most of the time, the implied volatility is slightly higher than the historical volatility. With a one year horizon, the relationship between historical volatility and implied volatility is not that obvious. An in-depth study of the predictability of historical volatility by implied volatility can also be found here in Wilmott Magazine. While the historical volatility describes the size of the variations of the past, the implied volatility describes the size of the variations of the futures, implied by the traded option prices. VDAX revisited – Implied volatility return vs. Index Return – Computer Aided Finance - Excel, Matlab, Theta Suite etc. linked to this post.